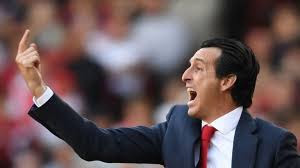 Unai Emery has revealed that he had to hold a dressing room chat session with his players to address one of their major problems. The Gunners' poor form away from home so far this season has been a pain in the but for them and the Spanish boss, just like the fans, is no longer comfortable with this. The latest evidence of the ugly occurrence showed up when Arsenal visited Goodison Park where they lost the chance to go to third spot on the League table. They would definitely have had a better season had they replicated their home record on the road also. At the Emirates Stadium, Arsenal out of 17 matches have scooped 14 wins, two draws, and a loss which came in their opening fixture with Manchester City - Unai Emery's first competitive game after replacing Arsene Wenger. The boss spoke to the press of how he met with his players to look for a solution to their poor away for that has seen them concede in every single one. “We were speaking in the dressing room how we can fix our problem,” Emery said. “We are consistent this season but if we need to improve something, it’s our away form. “If we win, we can continue in fourth. We must show everybody we can finish in this position. “We spoke a lot about that and what we need to improve. We need sometimes patience to improve this spirit. “We can be critical of ourselves for our away performances. Will Emery's talk have an impact on the team at Vicarage Road on Monday night? We will see how it goes against Watford.